If you are looking for a version of the classic springtime dessert that can travel, these soft cookies are for you! These not-too-sweet cookies are made with cream and studded with chunks of fresh strawberries in a biscuit-like dough, evoking the famous dessert they are named after. This portable treat is more like a scone than a true cookie. 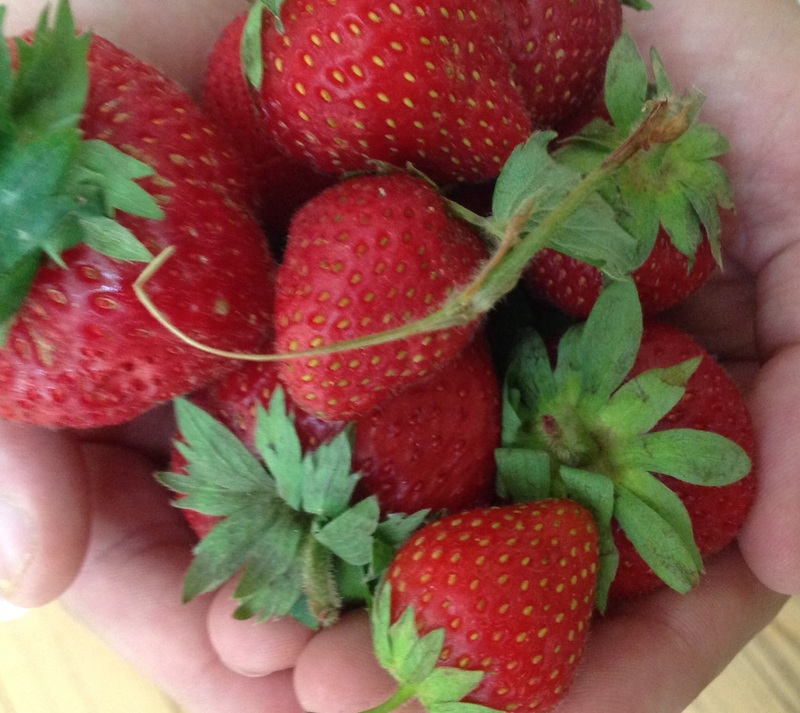 Combine strawberries with the lemon juice and 2 tablespoons of sugar. In a large bowl combine flour, sugar, salt and baking powder. Cut in the butter until mixture ressembles coarse oatmeal. Stir in cream until combined and a dough forms. Drain the strawberries and fold into the dough. On parchment lined cookie sheets, drop tablespoon-sized dough, spacing evenly. Sprinkle each cookie with some sanding sugar. Bake in the top half of the oven for about 24 minutes. Watch closely at the 20 minute mark as I found the bottom can easily burn. Transfer to a wire rack to cool. Best eaten same day or no more than 1 day later. These cookies are not very sweet so you may choose to increase the sugar quantity by a few additional tablespoons or serve them with a dollop of sweetened whipped cream like you would a scone. 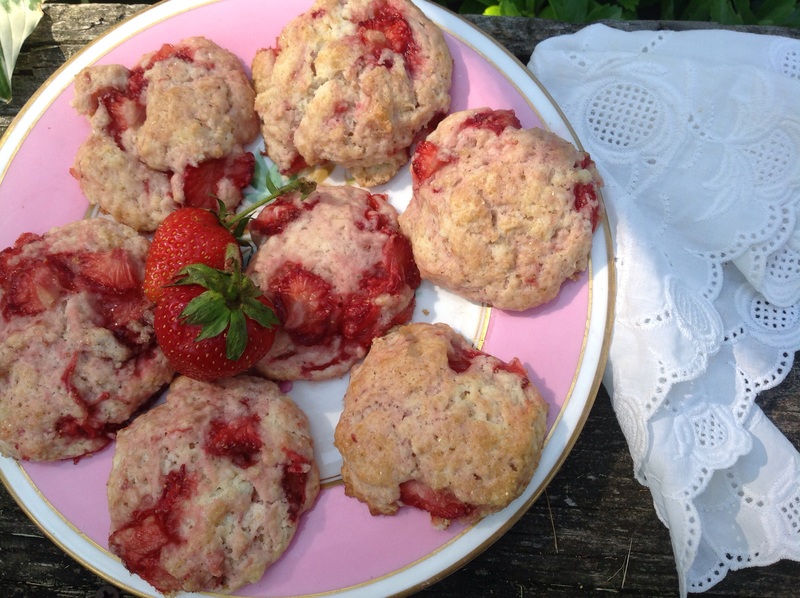 This entry was posted in Recipes and tagged fresh strawberry cookies, strawberry scones, strawberry shortcake cookies by Johanne Lamarche. Bookmark the permalink. I tried making a cookie like this last strawberry season and they didn’t turn out so well. I’m definitely going to use your recipe and try again! Your cookies looks fantastic! Let me know how these turn out! The draining of excess liquid from the strawberries is the trick to not getting the batter too wet. What did you not like about the cookies you tried last year? Thanks Jhuls! Happy FF weekend to you too. I make these cookies when the strawberries are in season and they are a fun take on the dessert. Enjoy! I’m so happy! Was the dough wet and did you add more sugar? 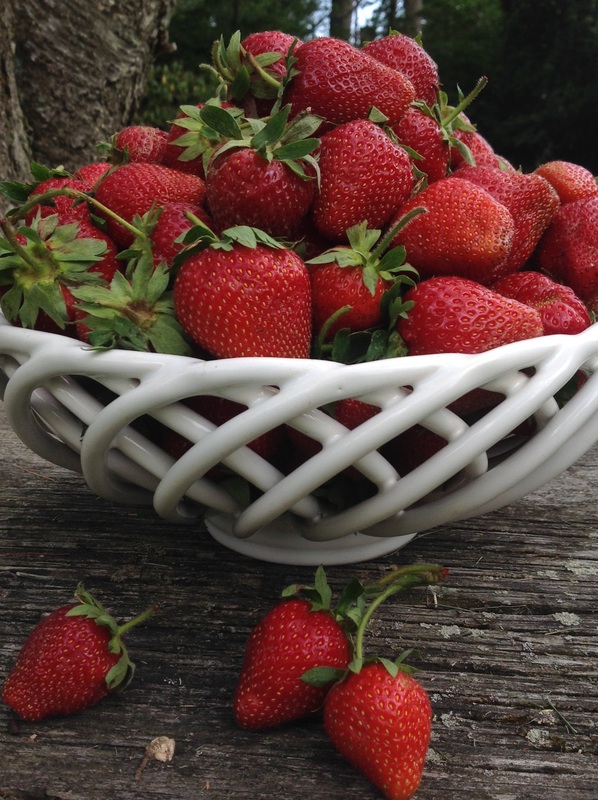 Was it difficult to handle the batter with the strawberries and cream? They look yummy! A question a serious cook would ask! The batter was a bit too wet which is why I added to drain the strawberries first because deoending on their sweetness, there is a variable amount of liquid extruded. Draining resolves this. They bake up fine though. Stay cool Loretta!!! Hey Johanne. Great combination of recipes. Sounds like they would be perfect for breakfast or served with some ice cream. Thanks for sharing with Fiesta Friday #72 Also thanks for the shoutouts. Have a great weekend. Happy FF! Thank you Quinn! Appreciate your hosting and all the delicious recipes you offer us. These cookies would be yummy with ice cream. We added some thick whipped cream and it make them really awesome. Then when does ice cream or whipped cream not make desserts sing?!!! My pleasure Naina. Thank you for hosting us! How clever is this? I love the scone-shortcake-cookie meld here. Our strawberries are just about gone—but peaches and blueberries are here. I bet either one would make a good substitute. Right you are Nancy! Controlling how wet the fruit is when it goes into the batter is the secret to keeping them tasting like a shortcake. I am predicting you are going to give this a try with those amazing TN peaches! I made these today and they are delicious! I drained the strawberries first and then proceeded to make the dough. Did not add extra sugar either…they are just the right sweetness. I made them a little bigger (only made two dozen) but they were done after the 20 minutes. A lovely soft chewy texture. YUMMY! So good to hear from you Karen and to know you liked the cookies! Enjoy!